So, this “New Year/New Me” wants to be focused, but she also wants to be organized. I have scoured Pinterest and dreamed of having that perfectly organized home, but I know that having a hubby & 2 almost grown boys still at home that isn’t going to be my reality. So, what do you do when that’s where you are? Well, here’s what I’m going to do. 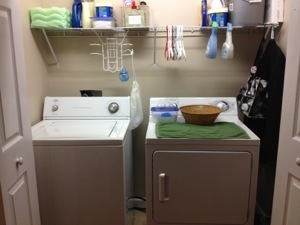 Tonight I began with my laundry closet. It’s not a large space, so I felt it was safe for my first night. I read a blog tonight by someone who was going to organize her home for $0. As I read, I realized how guilty I was for thinking I needed the cute containers or the bigger space before I could really organize. I didn’t take a before picture, but here is what my laundry closet looks like after about 15 minutes of cleaning out & organizing it. I have a garbage can for when I clean out the dryer screen, a basket & glass jar for putting the change & other pocket items I find, a hand towel to dry my hands on, all my homemade detergent, certain cleaners and hangers. I’m definitely happy with my first project!